TWO Cebu City officials believe that the country is still peaceful despite the result of an international survey that showed the Philippines among the least peaceful places in the world. 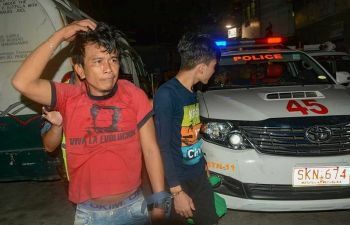 Mayor Tomas Osmeña and Councilor Dave Tumulak said the war on drugs that President Rodrigo Duterte is waging has helped a lot in maintaining order in the country. Osmeña admitted that most of the time, he doesn’t agree with how the president does things, but his program against illegal drugs is a good move. Without it, he said, the country’s peace situation would be worse than what it is today. “If (the slain) drug lords (were still alive), you think we would still be peaceful? I don’t agree with many things the president is doing but if he did not crack down hard, where would we be today?” the mayor told reporters last Monday. The Global Peace Index 2017 released this month shows that the Philippines is 138th among 163 nations that are least peaceful. The organization said the country’s overall score deteriorated since Duterte assumed office in June 2016.